If you don't know where to find the best sushi places, check out this guide to New York sushi restaurants. From tuna and crab rolls to vegetable rolls, there is something for everyone when they come to these restaurants. Check them all out now! This Zagat food 29 has hands down the freshest melt in your mouth fish in all of New York. The sushi is stellar, and the fish is very fresh. Each piece of nigiri is so perfectly seasoned that you need neither the soy sauce nor the wasabi. The rice is truly special, it is moist and warm under the mouthwatering fish. They most likely have the best Ikura, fresh, cold, and nonetheless naturally salted to perfection. The butterfish, cooked and served Gunkan style with their homemade unagi sauce is something you don't find very often served. Known for traditional and classic sushi without any diverting “fusion cuisine” tendencies, Sushi Yasuda has been a top-rated establishment in mid-town for over a decade. The blond wood and bamboo décor’s focal point is the L-shaped bar where patrons line up for their piece-by-piece sushi purist’s experience. With a Zagat Survey rating of 28 (extraordinary to perfection) for food, it’s not rare to see lone diners, intent on having an uninterrupted intimate encounter with their meal. Of course, the sushi is exquisite, but there’s also a tremendous selection of appetizers, sushi omelets prepared in-house, and desserts. Non-fish dishes, such as the maki rolls, shouldn’t be overlooked. With a slate tile façade and double wood doors, this hip sushi establishment in the West Village has been called some of the best in the city. 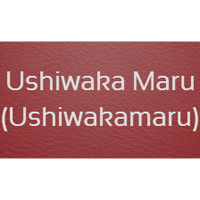 Ushiwaka Maru, also spelled as Ushiwakamaru, known for their fresh seafood and great fish selection has lived up to its place on the top Sushi list. They offer an omakase option, chirashi, and a sushi and sashimi combination. Other great options make their menu, including desserts prepared in-house like sesame ice cream and mochi. This is a Zagat rated 28 for food (extraordinary to perfection) establishment, making it one of the top locations in New York. 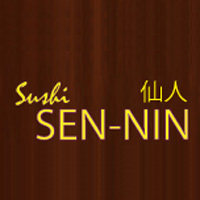 Not to give too much insider information, but Sushi Sen-Nin makes the top New York Sushi list because of its great reputation as a local neighborhood sushi establishment. Their quality is excellent with fresh fish flown in from Japan. Check the white board behind the register for what’s just come in. 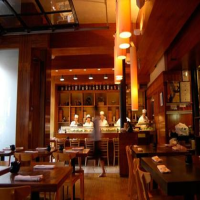 They offer many seasonal items, such as white salmon, Shigoku oysters, and soft-shell crab. Chef Matsu prepares exquisite dishes such as spicy tuna carpaccio with tempura crumb topping, and special rolls like the Crazy Dragon Roll, Rainbow Roll, and Empire Roll. 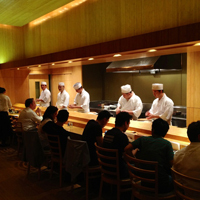 They also serve non-seafood dishes such as Kobe beef, and skewered free-range chicken. The Sapporo on tap is great to wash it all down. 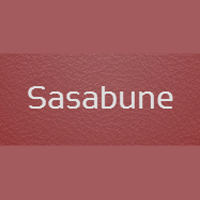 Catering is available, along with hosting of special events, such as sake tastings. Looking for very good fresh sushi in one of the pioneers of Japanese cuisine in New York? Haru Sushi Restaurant is the right place for you. Known to be one of the longest standing establishments in the region, they have some very good specials and it will not break the bank! They offer a good variety of fresh food with a quick delivery. Excellent bento boxes, Rock Shrimp Tempura, and Kamikaz roll, and other great selections for everyone, even kids! The Miso soup is so tasty, and people who do not care for sushi may enjoy the delicious chicken Teriyaki. Come Enjoy the Best Sushi in New York! One of the best reputed sushi restaurants in New York, designed by world renowned architect Tadao Ando, Morimoto is literally a piece of modern art. It has an extraordinary open kitchen surrounded by a 24-seat sushi bar where you can watch Morimoto and his chefs work. On every level of the restaurant you will enjoy the elaborate menu where East meets West. The tuna tartare presentation is fabulous and sushi is really good. You may also enjoy the best Halibut that will make your tongue happier than it has been in a long time. Best New York Sushi for Eat in or Take out! The ambiance at Gari is something to be enjoyed, and the food is just fabulous. They use real wasabi, and the sushi is superb and unique. 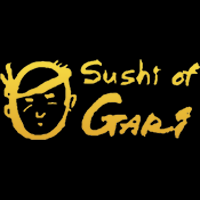 That is why Gari is one of the best sushi restaurants in New York. Once you taste their creations it's no surprise they have a Michelin Star to their credit. Make sure you get a seat at the sushi bar, it is always best to eat each piece as it comes directly out of the chef's hands. Watching the chef artistically piece together their delicious fish creations make it all the better. 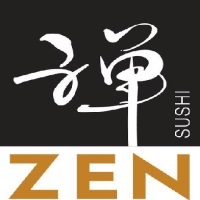 Chef Suzuki of Sushi Zen is a master of his craft and is considered the dean of sushi in New York. Freshly grated wasabi root, fresh fish flown in from around the world and painstaking care are all part of wonderful artistic meals. The quality of the sushi is impeccable. Each dish is constructed with attention to detail in presentation and flavor. They use many unique sauces that make each of the dishes extraordinary. Their food is as authentic as the kind and attentive service. The food shines above and beyond any other Japanese sushi restaurant in New York. Every piece of sushi is crafted to be something unique with flavors depending on the type of fish you are being served. Watching Chef Masa working his magic with each piece of fish is like watching an artist painting a masterpiece. 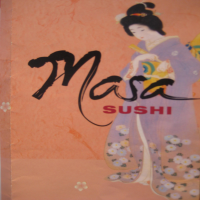 The service is unmatched and everything meets Masa's perfectionist style. The sushi is good enough to make you believe that you've never had "real" sushi before.